Technically that would be yesterday. Day 1 that is.. Yesterday morning we left home at 07h00. We rode to Kempton Park, where our country’s largest airport is. But we are not flying with wings, The northerm riders rode together from Kempton Park. Near Heilbron we went through a terrifying electrical storm, with a lot of rain pouring dowm. Anyway, all the Word Riders came together at Bethlehem, the main town of the Eastern Free State. We had a lovely stay at The Lofts in Bethlehem. Supper was at the Bethlehem North Dutch Reformed Church. They managed a barbeque in pouring rain, and gave us an excellent meal! This morning our group split up and visited 5 churches in the region. I had the honor of preaching at Bethlehem Effrata DRC. Psalm 107 was used as my Scripture reading. Afterwards we drove the 37 km to the scenic town of Clarens, a place so beautiful that Brad Pitt owned a house there. The photo above is on the outskirts of town. The road behind leads to our South African Golden Gate, where 25 years ago my wife and I began our honeymoon on 31 March. Yip- silver anniversary coming up! After an excellent Roti lunch provided by the DRC Clarens, we drove over some bad tar roads but through beautiful countryside to Ladybrand, where we are staying at the Cranberry Cottage. Another excellent place to stay! WE are having a lot of fun so far on this tour, and have done nearly 700 km since leaving home yesterday. I dont get much chance to stop and take photos yet… will try to get some from the support team to share later on. But now it is time for bed, we have to cross an international border at 7 tomorrow morning. It feels so strange to know we are sleeping just 13 km away from a totally different country’s capital tonight. I am so looking forward to finally get a Lesotho stamp in my passport! You can also have a look at wordriders.wordpress.com for more info on our tour. 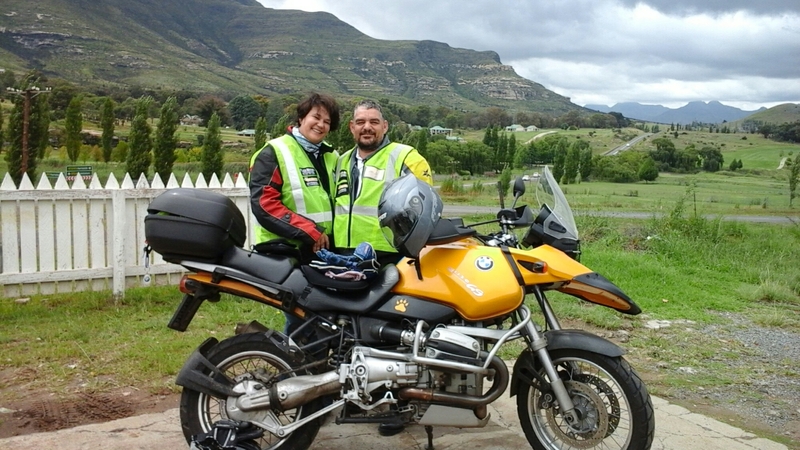 This entry was tagged Bible Society, Lesotho, Motorbikes, Motorcycled, South Africa, Word Riders. Bookmark the permalink. You have such a beautiful land to travel. I enjoy your posts and pictures. Thanks Shirley! And this month I am really seeing a lot of it!